In the civilian world, many people move in order to expand their homes--at least until retirement when many choose to downsize. But we military families move all over the world, and our homes expand and downsize as we go. 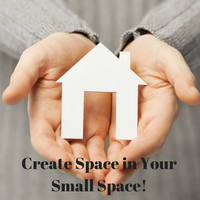 As fun as it can be to live in different places, I think we’d all agree that it's much easier to expand into a larger space than it is to shrink into a much smaller one. Here are 5 tips to help you adjust to small space living. 2) Get a storage unit. There are going to be a lot of things you own that you don't have space for and don't want to part with. Get a storage unit to store all the sentimental things that you don't use on a daily basis, but want to keep. Remember to include the unit on your rental insurance. My husband and I had all of our belongings stored, and someone stole $7,000 worth of our stuff. Thankfully, we had renters insurance for the unit and we were fully reimbursed. But can you imagine if we didn't? You may not have room for a desk, bookshelves, and storage cabinets, so consolidate them into one piece of furniture. My brother lives in a studio apartment with his wife in downtown San Francisco so, as you can imagine, his space is extremely limited. After downsizing their furniture, he searched and found an antique hutch that he uses as a desk, storage, and liquor cabinet. Because your living space is limited, you need to be picky about what you bring into your home and make sure it has a purpose before bringing it inside. Walls are useful in providing more than structure and privacy. Use them for storage and decor! All those mugs that keep accumulating, but you never use because you already have a favorite? Hang them on the wall--they don't need to be taking up precious space in your cabinet. And mount your TV. No need to take up floor space with an entertainment center if you can just put your TV on the wall. Also, consider hanging your herbs in a rack instead of letting them take up counter space. These are just a couple of examples, but be creative and think of all the other things you can store on your walls! Placing mirrors throughout the home, especially in smaller rooms, will brighten up the space and make it feel bigger and open. Just get used to seeing a lot more of yourself! As you downsize this PCS season, get creative with your small space. Find unique pieces of furniture, incorporate light in your decor, and keep only your necessities out in the open. Enjoy your small space living. Before you know it, you’ll make another PCS and have more space than you know how to fill!